So on Friday we finished up Owl at the Intimate. 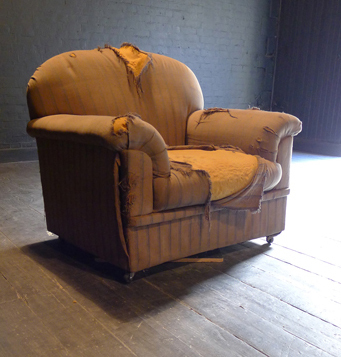 We’ve stowed the armchair until June when we head up to Grahamstown for the National Arts Festival as part of the Cape Town Edge. I was really nervous about this run and went through a lot of dark moments but ultimately it was a success. Many aspects could have gone better, and I have definitely learned a lot. As promised I’ll be sharing a break down of the process here. At times it may not be the most orderly, since I’m going to be posting chapters as I write them, rather than creating a master report as I would with a project like the Cape Town Edge. So bear with me and if there is anything you’d like me to elaborate on then email me or post a comment. Critical – What did people say about the work? The reviewers and the people you respect whose brain you pick over a cup of tea two weeks later. 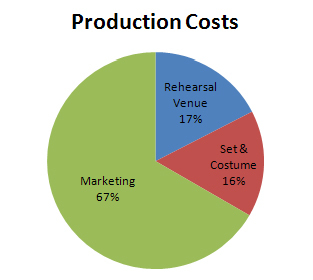 Financial – This is very much bound up with getting audience into the theatre. Looking at a budget, did I make back my costs? After that if divide my portion of the profits did I make more per hour than I did working as a store clerk? Do I have enough to do it again and also buy the groceries this week? Professional – Thinking long term, has this helped your career? Did the Gatekeepers see it? Is it another line on a CV? Quite a tough one to judge as the ripples a production makes can sometimes only be discovered years later. So here’s Part One of the report back on Owl. The big facts of the production are two numbers: R3 131 and R13 980; Costs and Income. The lion’s share was clearly the money spent on marketing. This included a professional photographer to take shots for the poster and profiles of the team, printing 18 A3 full colour posters, 1000 business card ‘flyers’, and the opening night catering – an area I will in future cut down on (more on this in Part 2). I think this is a fairly good idea of what proportions you should be spending in, even if you adjust the particulars for your strategy. The publicity was done by myself, which I do not recommend (I recommend THIS) – but which had to be the case. I tried to find the dream publicist but the first marketer I sat down with simply couldn’t take on the project and turned me on to another, likewise unable to help. These two were my first choices as antidotes to the ‘usual’ publicists and my attempt to get new audiences in. When they fell through I tried one of the best theatre publicists in Cape Town who I have worked with before. Unfortunately she was on vacation. My fourth meeting and tenth cup of tea with a potential publicist really excited me and we agreed to work together. For reasons I’ll never really understand she left me hanging for ten days before I realised she was overcommitted and couldn’t deliver. By this stage I was desperate to get out my press releases. Rather than waste time searching for another choice (even a day would have been a waste as I was 2 weeks to opening night) I decided to do it myself. I took it on because I have the resources, the energy and have spent a lot of time thinking about marketing. Even then I knew that a lot of the great ideas and tips I’d talked about with the potential publicists would have to fall by the wayside. That I got the audience I did is more a validation of the system and the building blocks of PR strategy than any credit to myself. 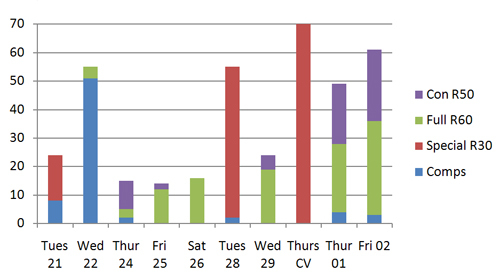 Slow first week dominated by complimentary tickets. Skyrocketing the second week. Why? Reviews. All told, about 380 people came to watch Owl. Not bad. For the next post I’ll elaborate on the Marketing Strategy and focus on the fundamentals – which I never go much beyond this time round.